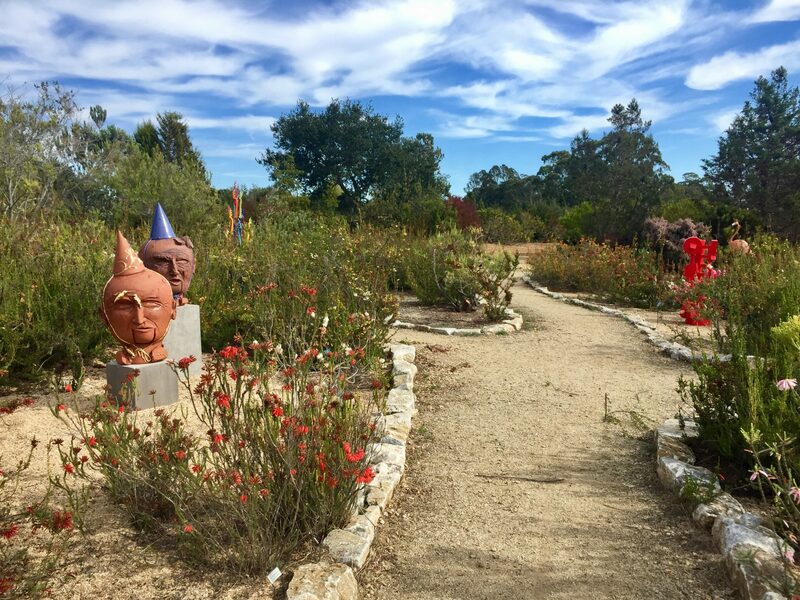 Santa Cruz has both magnificent natural beauty and spectacular artwork that merge into vibrant garden galleries through the collaborative visions of landscapers and artists. The UC Santa Cruz Arboretum is a cultural and creative haven where the connection between art and nature is celebrated. 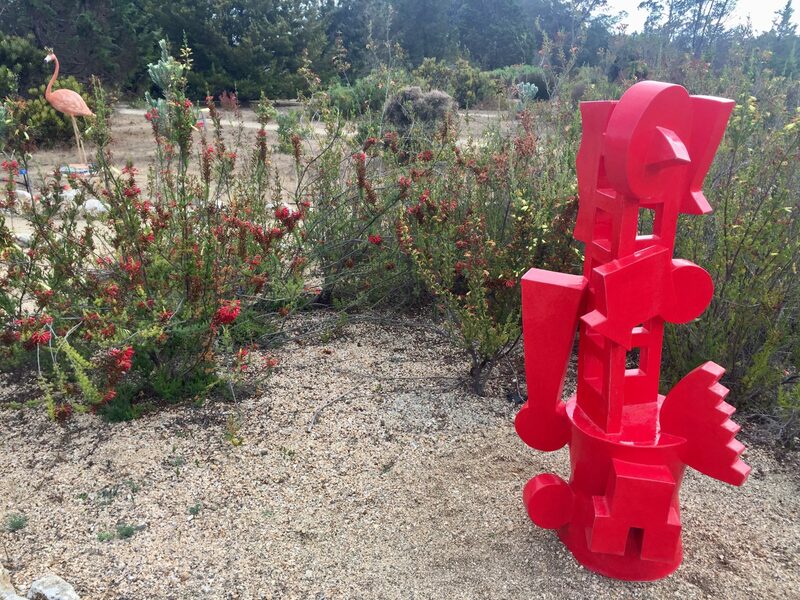 This weekend marks the opening of its second outdoor sculpture exhibit, Art in the Arboretum: Color, presenting works by local artists immersed throughout exotic plants from around the world. Art in the Arboretum: Color, featuring work by fourteen local artists. 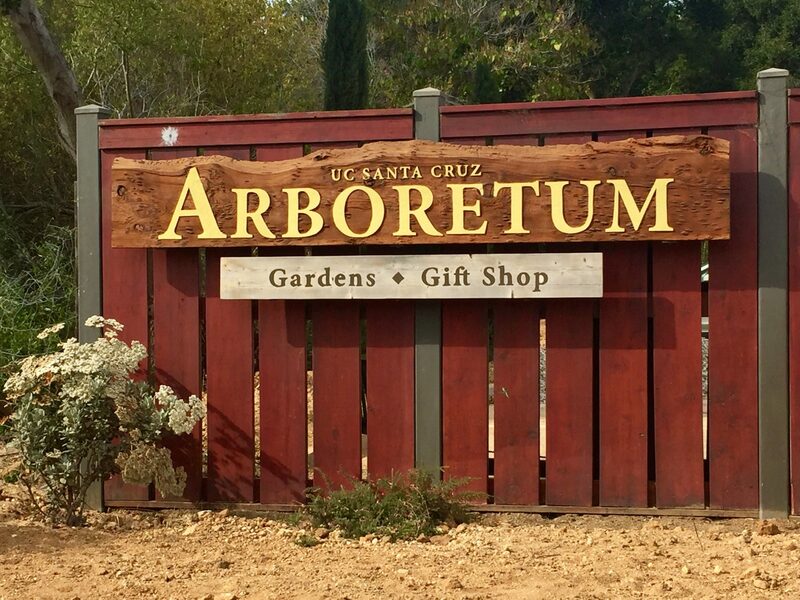 The Arboretum is spread across a longstanding marine terrace, and is open daily as a research and teaching facility, as well as display grounds offering self-guided tours for the UCSC campus and public. The center has a diverse botanical collection with representations from over 300 species including rare and threatened plants, and maintains Mediterranean gardens featuring flora native to California, as well as Australia, New Zealand, and South Africa. 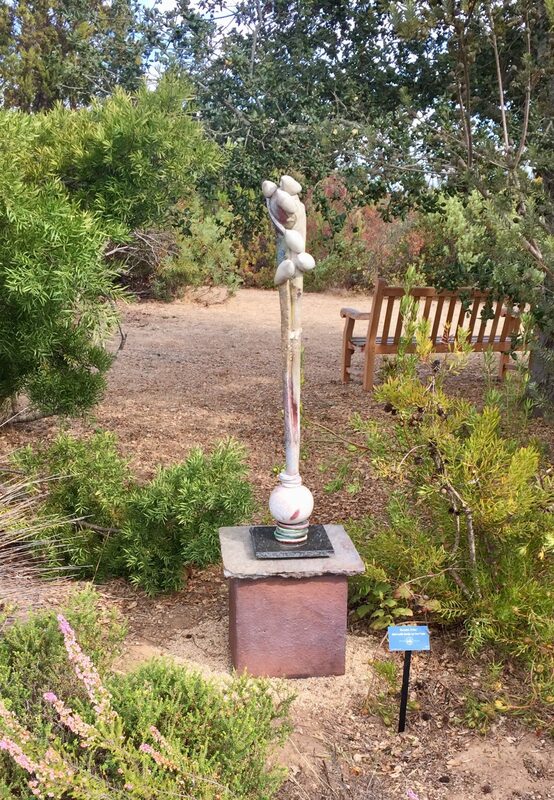 In addition to the specialty gardens, the Arboretum has views of the Monterey Bay, interpretive trails, Norrie’s Gift and Garden Shop, annual events, and workshops/demonstrations to educate and engage the community about plant life and conservation. The current exhibit will be on display mid-October through mid-January in the Arboretum’s South Africa and Aroma Gardens. It is the second of two yearly rotating sculpture exhibits offering both nature and art lovers a playful outdoor experience. 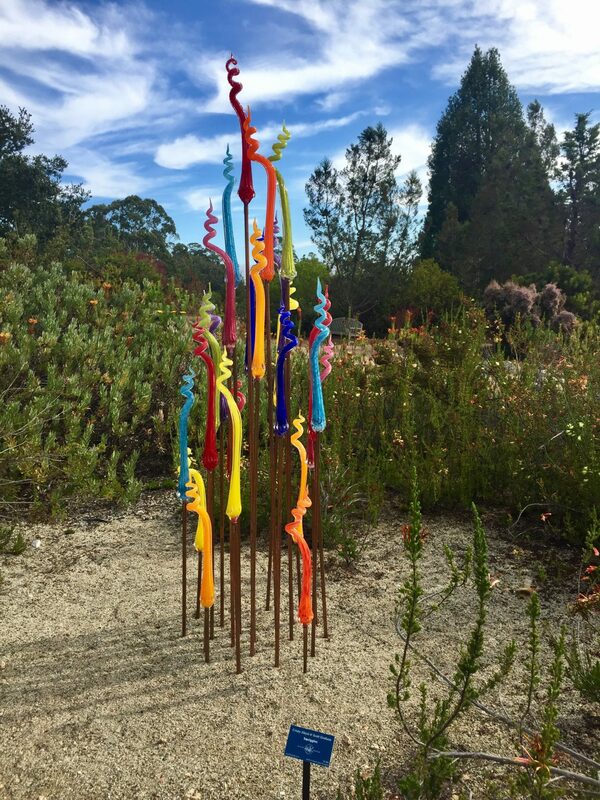 The 2016 exhibitions – Art in the Arboretum: Sculpture and Art in the Arboretum: Color – have been created and curated by award-winning local artist, Susana Arias. Arias was honored as the 2013 Artist of the Year for contributing to the cultural enrichment of the Santa Cruz community, and is internationally renowned for her sculptures, paintings, and public art. 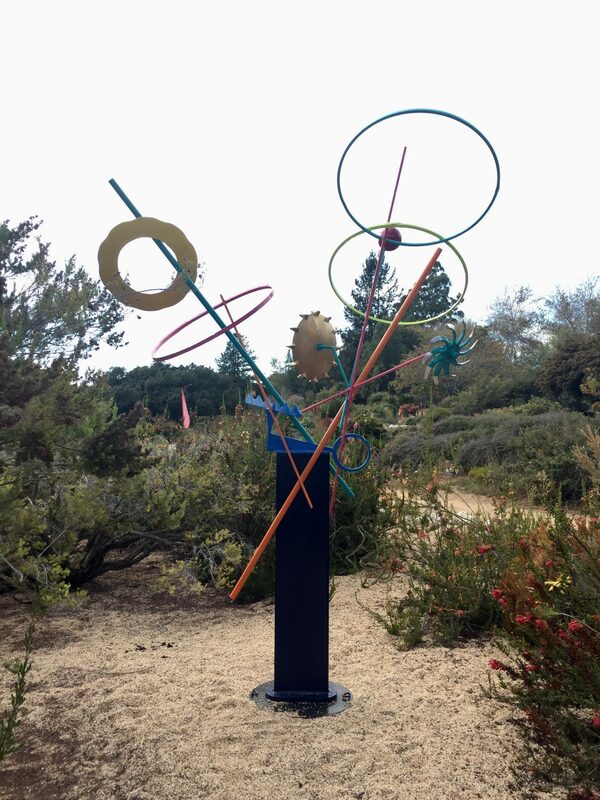 With the assistance of Arboretum Staff Lead Jennifer Macotto and an Art in the Arboretum Advisory Committee, Arias has been passionately spearheading the project of bringing exhibits into the gardens to promote Santa Cruz art and encourage local artists to share their work. For Color, she has selected and curated works from fourteen local artists. The participating artists include Jamie Abbott, Cristy Aloysi and Scott Graham, Susana Arias, Lea De Wit, Barbara Downs, Eileen-Fitz-Faulkner, Roy Holmberg, Nancy Howells, Marilyn Kuksht, Bo Kvenild, Terrie Kvenild, Anna Martin, Barbara Vanderbeck, and Stan Welsh. 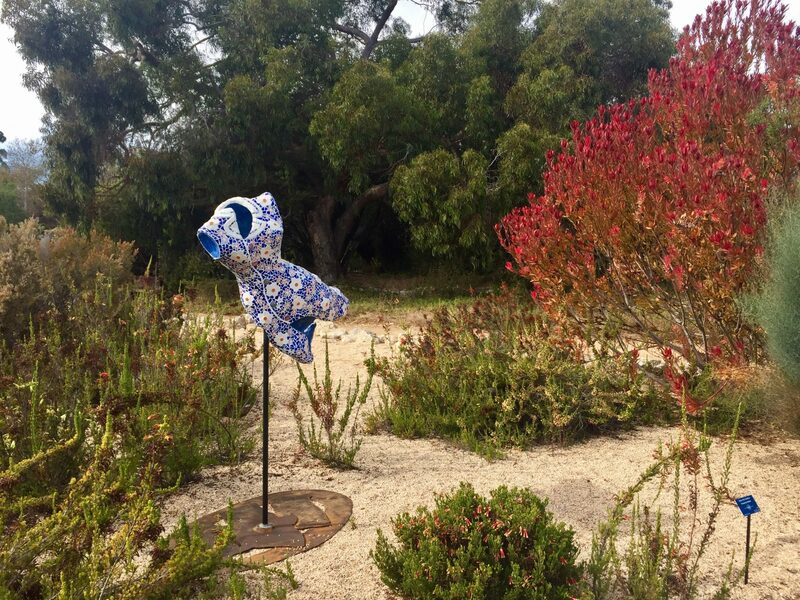 The artwork displayed throughout the landscape brings a decorative liveliness to the gardens during the dormant season, and the pieces compliment the vibrancy of the plants that surround them. The sculptures have been created using diverse and durable materials including glass, painted steel, glazed ceramics, and mosaic. As part of their hands-on opportunities, the Arboretum is providing workshops in welding and metal construction led by four of the participating artists during the Color Opening Reception on November 4th. The Arboretum and Arias are inspired to continue the program in the coming years, and plan to expand the exhibit to include more artists and further engage the community in art activities. Arias is envisioning innovative possibilities for future exhibits, including kinetic sculptures and installations, long-term structures, and art objects that staff and community will be able to use at special events. To view biographies from the fourteen participating artists, reserve a place in the upcoming workshops, and learn more about this and other events, visit the Arboretum website. The Opening Reception for Art in the Arboretum: Color will be on Friday, November 4th, 4 – 6pm, with Workshops 1 – 3:30pm. The exhibit will be on view October 15, 2016 – January 10, 2017.